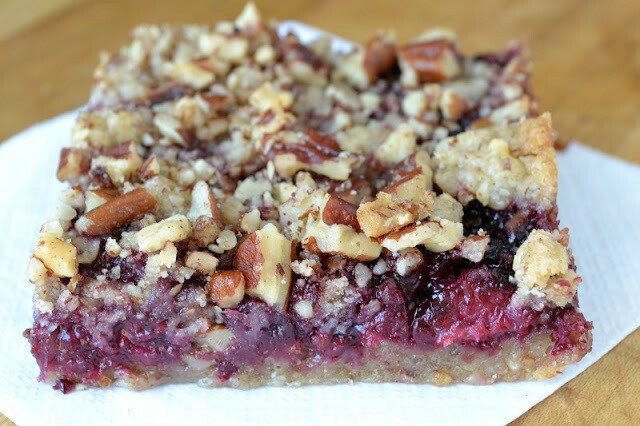 I look forward to a batch of these Blackberry Pecan Crumble Squares every summer when berry picking season is in full swing. Line a 9x9 baking pan with a sling of parchment paper, edges hanging off the sides for easy removal from the pan later. In a food processor, pulse the flour, 1/2 cup pecans, sugars and salt a few times to combine. Add the softened butter and pulse until the butter is thoroughly incorporated and the mixture has a large moist crumb texture. Keep pulsing until there is no dry flour left. Measure out about 1/2 cup of the mixture for the crumb topping and set aside. Put the rest in your lined pan. Spread it out and pat down the crust with your hands or the back of a measuring cup. Press firmly and get it evenly distributed. Pinch the remaining crumb mixture together with your fingertips to form larger crumbs for the crumble topping. Set aside. Process the fresh berries and the preserves in the processor briefly to break down the fruit. Put the mixture in a saucepan and heat to simmering. Let it bubble away gently until the mixture thickens a bit. This took me about 20 minutes since my berries released a lot of liquid. Take off the heat and add the splash of lemon juice. Spread out the fruit evenly over the crust. Top with the remaining crumble mixture, and then the 1/3 cup finely chopped pecans.